Steven Gullotta Electro, Industrial Last year in April I had the pleasure of reviewing Psy'Aviah's Seven Sorrows, Seven Stars - an album that was jam packed with talented singers and producers throughout the electronic scene. I was not only impressed with what I heard but found myself fascinated as to how Yves Schelpe, the mastermind behind Psy'Aviah, was able to work his digital magic around the voices of everyone involved. His wonderfully crafted pieces rang highly in my head and were hard to get out for quite the while, and I'm about to repeat that beautiful process all over again thanks Psy'Aviah's brand new album Lightflare. Due out in February of 2018, Lightflare is an album full of hope that, in the words of Schelpe himself, "...leave behind those bitter moments in life, the album is a beacon, shining, standing tall like a lighthouse in a rough ocean storm, waiting to be a guide for all those lost at sea… For those wandering souls, for you, and perhaps – and more than likely – even for the 'future me'." Those poetic words make the gorgeous cover art seem much more tangible - at first, you see a person stranded on a boat in the middle of a raging sea. But with the comforting words and description from Schelpe himself, we know that they are on their way into a new and brighter time. Alas the true magic is worked when the music is played, so let me dive into that. The appropriately titled 'Lost At Sea' opens up the album featuring Mari Kattman on vocal duties. You may recognize Kattman from her own solo project (be sure to check out the debut album Hover) as well as her past project Day Twelve). Either way, if you've never heard of Kattman before now is a brilliant time to discover her talented self as she comes in full force as I've ever heard her on 'Lost At Sea'. A swirling ray of emotional electro sweeps up a majority of the song with an ambiance perpetually echoing throughout the track. Kattman also makes an appearance on the electropop track 'Heavy Heart' - this is not a song you're going to want to skip. Just like in Psy'Aviah's previous album, the collaborations do not stop there, they just mount and make Lightflare better and better as I continued along. Ellia Bisker of Sweet Soubrette brings her powerful cabaret-flavored vocals to the slower paced track 'Aftermath'; live singer for Psy'Aviah and KOALA member Marieke Lightband brings her colorful and dazzling chords to 'The Great Disconnect'; Addie Nicole of Halocene turns up the alternative electronic tunes with her biting call on 'Sound of New'; Michael Evans of MiXE1, Kyoko Baertsoen, David Chamberlain of Entrzelle, KONER, Phoebe Stone, and Lofthill all make appearances as well. I could go on and on and describe each collaborator's abilities, but I feel as if this is something you should listen to rather than read. Perhaps my favorite collaboration on the whole entire album comes from the track 'Reboot Reset Relay'. The science-fiction fueled song is one of the more upbeat tracks on the album with trance-like dance synths causing addiction. Fallon Nieves performs the vocals on this song as well complete with a digitized filter, glitches, and the like. Be sure to check out her work on the very sassy sounding 'Mr. Vanity' as well. The second bonus disc is not your typical fair of one remix after the other. Dispersed throughout this remix disc are several ambient, trip-hop, and electro meditative mixes titled 'Earth, Wind, Fire, Air and Sky', 'The Rhythm Will Guide You', 'Truth Is My Identity', and 'Searching Anagata'. Each one of the songs sound like they should be on their own separate EP, but it was lovely having them give breathers throughout the remix disc. Rool, SD-Krtr, People Theatre, After Future, Assemblage 23, Chaos All Stars, Cyborgdrive, Isserley, and Jean-Marc Lederman all appear as guest remixers on the second disc. I enjoyed the People Theatre remix the most out of this bunch as I appreciated the more minimal synthpop approach the project tok with the song. It really allowed Bisker's voice to pop out more while providing a catchy dance floor tune. At the end of my journey with Lightflare I came out just as satisfied as I did when I listened to Seven Sorrows, Seven Stars. The music is fun and addicting, emotional and moving yet hopeful and positive. Like the lighthouse metaphor Schelpe used in the beginning of this album, this album is a bright beacon in the midst of despair. You do have a couple months to wait before the album releases, but I'm sure it will be worth the wait through and through. Last year in April I had the pleasure of reviewing Psy'Aviah's Seven Sorrows, Seven Stars - an album that was jam packed with talented singers and producers throughout the electronic scene. I was not only impressed with what I heard but found myself fascinated as to how Yves Schelpe, the mastermind behind Psy'Aviah, was able to work his digital magic around the voices of everyone involved. 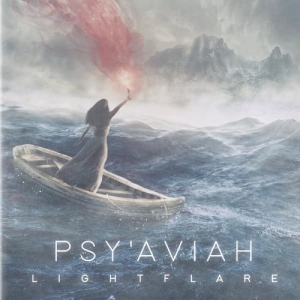 His wonderfully crafted pieces rang highly in my head and were hard to get out for quite the while, and I'm about to repeat that beautiful process all over again thanks Psy'Aviah's brand new album Lightflare. We've Created a Patreon - Support Us So We Can Support More Music!